Science fiction often portrays robots on the extreme ends of the spectrum: helpful and ready to learn and serve, or dangerous and preparing to take over jobs—and perhaps the world. Luckily, that fiction isn’t the reality. The evolution of robotics has only just begun. Robots are no longer just difficult-to-program immobile units on the side of a conveyor that can perform only a single task. They now come in all sizes, shapes and capabilities. Many are mobile and easy to program. But still, can they really benefit the human workforce? Collaborative robots, called cobots, have become a helpful, vital solution for many businesses. They can be used for dangerous or dirty jobs, as well as fill the gap left by tasks that are too small or too boring for humans to perform. 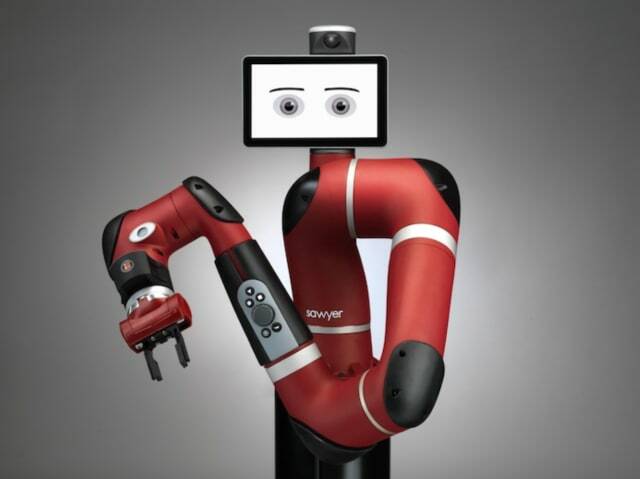 Cox Container, a plastics blow molding manufacturer, needed such tasks performed and sought a solution with Sawyer, a cobot from Rethink Robotics. Cox Container had difficulty finding and retaining employees for certain jobs, particularly a work cell that required two employees to pack bottles. It was difficult to sync the pace of work within the cell, which alternated between requiring two employees and only needing one. Sawyer alleviates this problem. The cobot assists one employee in the cell with packaging, which frees the other employee to work in a different area of the factory. Sawyer’s role in the facility is to pick up bottles from a conveyer belt and place them into a bin. The cobot is programmed to know when the bin has reached a specific level, at which point it grabs a cardboard divider from another area, places it in the bin, and starts filling the bin with another layer of bottles. The cell operator then completes the final packing and gets Sawyer started on a new bin. Check out Sawyer at work here. Sawyer not only helped Cox Container fill employment needs, but it also improved productivity. The fact that the cobot was programmed and working within one day has the company looking at other areas where it could benefit from the use of additional Sawyers. Cox Container is just one company in a long line of businesses benefiting from cobots. Bak USA, which builds laptops for elementary to high school classrooms and durable tablets for the working world, incorporated the Kawasaki duAro dual-arm SCARA robot to perform screwdriver tasks. Using the robot sped up the process and ensured proper torque was completed. Other industries also could benefit from the use of cobots. KUKA, robotics manufacturer, recently presented its research into using its LBR iiwa lightweight robot as a training tool for hip replacement surgery. The robot’s ability to sense pressure and cutting limits could potentially offer invaluable feedback to surgeons. Interested in learning more about cobots? Check out A History of Collaborative Robots: From Intelligent Lift Assists to Cobots.